The list of the reasons why Bali has become one of the most visited destinations for retreat goes on and on. There are many aspects from Bali which keeps making people curious to visit and want to come visit again. If this is your first time in Bali, it is recommended to stay at one of Seminyak villas. Of course, Bali has large areas where you can venture to. Seminyak is not the only place you can visit for your holiday in Bali. However, Seminyak has everything you need to really enjoy the finest of Bali. You can easily spot fine restaurants, chill bars, boutique shops, fun café, beaches, and many more. It alo grants you easy and fast access to the airport. Compared to other areas in Bali, Seminyak can be considered as one of the most crowded one. However, it doesn’t mean you can’t enjoy serene vibe. You can still find piece of tranquility from the accommodation you choose. That’s why renting a villa is more recommended for you during your holiday in Bali. There are lots of villas in Seminyak that you can rent. To make it easier with searching and booking process, it is recommended to use a rental villa management company. The Best location for accommodation in Seminyak. Seminyak is situated between Legian and Canggu. That’s why it grants you great access to most important places within close proximity. Thus, you won’t waste much time venturing around the place. Petitenget is one of recommended area where you can stay and find the best villa to rent. It is located in more north of Seminyak. In this area, it will be easy for you to find boutique shops and fine restaurants. The villas situated in this area mostly offer luxury features started from amenities, services, to facilities. Another recommended area is Jalan Kayu. This particular area has become one of the most popular places to stay since it is one on the main streets in Seminyak. However, its location is more inland and your access to the beach is not in short distance. This place is more suitable for peaceful retreat. Double Six Beach is also a popular area amongst tourists. It is situated in the southern area of Seminyak and closer to the borders Legian. This is also famous amongst young travelers who like to chill and fun while enjoying their time in Bali in slower paces. Aside from hotels, there are various villas situated in this particular area. Thus, it is recommended to book beachfront villa so you can enjoy the view of the beach anytime you open your eyes. 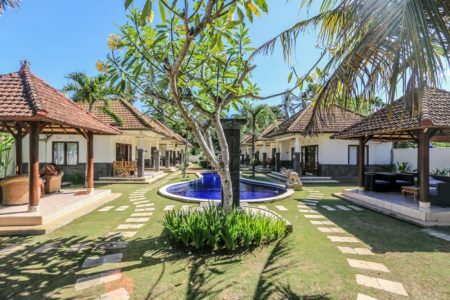 Booking one of Seminyak villas in Bali is relatively easy, there are no complicated procedures and the payment method is clear. It is also recommended to book villa that really fits not only your preference but also needs. You also need to remember that the prices change depending on the season. During peak season or school holiday, the rate will increase and it will relatively go lower during low season.